Introduction: Ligamentous injury is widely viewed as a key to the pathophysiology of chronic neck pain. However, this hypothesis has little support with respect to data correlating patient status with either repair-promoting treatments or documentation of regained stability. Dextrose prolotherapy can potentially promote inflammatory and repair processes in these tissues. We describe a case employing this approach, coupled with longitudinal stability assessment, in a patient with chronic neck pain associated with atlantoaxial lesions. Case presentation: A 47-year-old female with a history of trauma presented to our clinic in 2013 with headaches, chronic pain in the neck and upper limbs, and intermittent tingling in one arm. Pain was exacerbated by head movement. Examination showed crepitation at C0 – C2, and severe spasms and tenderness in the trapezius and paraspinal muscles. The patient was treated with dextrose prolotherapy at each of four visits over five months. Digital motion X-ray (DMX) was performed between visits 1 and 2, showing straightening of cervical lordosis and upper and lower cervical instability, with offsets of right and left lateral masses of C1 on C2, anterolisthesis of C2 on C3 and of C3 on C4, capsular ligament damage at C6-C7 and facet hypertrophy at C4-C5. At visit 2, tingling and crepitation had abated, while pain intensity was unchanged. At visit 3, headaches had resolved, and pain had become more localized. At visit 4, pain intensity had decreased significantly, crepitation had resolved completely, and she had begun bicycle exercise. DMX one month after visit 4 showed persistent straightening of lordosis and facet hypertrophy, as well as some anterolisthesis, while the offsets of the lateral masses of C1 on C2 with rotation were reduced by 33-50%. Conclusions: Dextrose prolotherapy was associated with progressive symptomatic relief and functional gain, beginning one month after initiation of treatment, and also with improvement of upper cervical stability. The findings support an approach to chronic neck pain based on the facilitation of ligamentous repair. Figure 1. Atlantoaxial instability (C1-C2 instability). The atlas is shown in the rotated position on the axis. 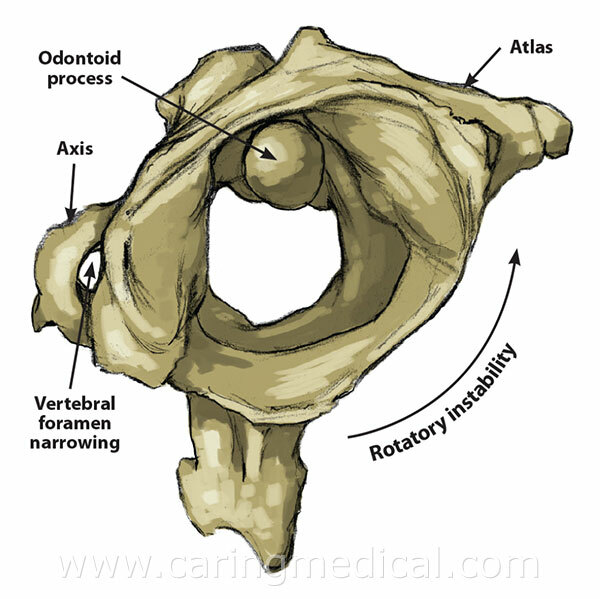 The pivot is the eccentrically placed odontoid process. In rotation, the wall of the vertebral foramen of the first cervical vertebrae decreases the opening of the spinal canal between the two segments. This can potentially cause migraine headaches, C2 nerve root impingement, dizziness, vertebrobasilar insufficiency, “drop attacks”, neck-tongue syndrome, Barré-Liéou syndrome, severe neck pain, and tinnitus. These correlative studies support the hypothesis of ligament injury as central to the pathogenesis of chronic neck pain due to trauma, or accumulation of microtrauma. This view of pathogenesis suggests that symptomatic improvement would be associated with improved ligamentous function, and also that treatments targeting ligamentous repair processes might be effective. However, there have been few reports incorporating either longitudinal assessment of cervical stability or repair-targeted therapy, particularly in cases of upper cervical instability. A potential therapeutic approach focused on the promotion of soft tissue repair is prolotherapy, in which irritant or sclerosant solutions (commonly dextrose at 12 – 25 percent or sodium morrhuate at 0.1 – 1 percent) are used to initiate inflammation/wound healing responses. The solutions may include other components, such as manganese or polidocanol. Randomized controlled trials have shown efficacy for dextrose prolotherapy in lateral epicondylitis6, knee osteoarthritis7 and Achilles tendinosis.8 Two observational studies have demonstrated significant gain using dextrose prolotherapy in cases of trauma-related chronic neck pain associated with lower cervical instability.9,10 One of these studies provided radiographic evidence of improved translational stability.8 However, the use of prolotherapy in cases of instability in the upper cervical region, in which stability is especially dependent on ligament integrity, has not been reported. Here we describe our initial experience using this treatment in a case of chronic neck pain with radiographically proven upper cervical instability. A 47-year-old female presented to our clinic in 2013 with chronic neck pain. The patient had been in two motor vehicle accidents (2008 and 2013), in each of which she was rear-ended. She had sought relief unsuccessfully with NSAIDS, muscle relaxants and physical therapy. Symptoms included pain in the upper limbs, headaches, muscle tenderness and spasm, sub-occipital pain and clicking, and intermittent tingling down her right arm. Pain was exacerbated by head movement. The patient also reported decreased range of neck motion. Physical exam revealed straightening of cervical lordosis, decreased range of motion for extension, lateral flexion and rotation (bilaterally), crepitation at C0 – C2, and severe spasms and tenderness in the trapezius and paraspinal muscles. Muscle tenderness was most significant in the C0-C2 area. Sensorimotor exam was normal bilaterally. The patient was given advice regarding posture and told to avoid high velocity manipulation, self manipulation, neck stretching exercises, and motions that cause crepitation or clicking. Dextrose prolotherapy was administered in the upper and lower cervical region at initial visit, and three further treatments were provided 1, 2 and 4 months later (visits 2 – 4). The injectant for prolotherapy contained 15% dextrose, 0.1% procaine, and manganese sulfate, 5 mcg/cc. Each syringe contained 10 cc (60 cc total injected volume). The areas treated are listed in Table 1. All sites were treated bilaterally. Between visits 1 and 3, the patient also attended physical therapy sessions three times a week. Digital motion X-ray (DMX) was performed between visits 1 and 2. The DMX showed straightening of cervical lordosis and instability throughout the upper and lower cervical spine. Upon right rotation, the left lateral mass of C1 displayed a 30% offset on C2, while on left rotation, the right lateral mass of C1 displayed a 40% offset on C2. In absolute terms, atlas lateral shift was 1.85 mm during left lateral bending and 0.73 mm during right lateral bending These findings are indicative of capsular ligament damage at C1-C2. There was also significant anterolisthesis of C2 on C3 and of C3 on C4. Capsular ligament damage at C6-C7 was indicated by gapping of those facet joints. Facet hypertrophy was evident at right C4-C5. Table 1. Structures in the cervical region treated with prolotherapeutic injectant. The following structures were treated at each appointment in both Case 1 and Case 2 with gradual resolution of symptoms. 1Includes intertransverse ligaments; 2Includes capsular ligaments. At visit 2, the patient reported that tingling in the arm had abated and her neck crepitation had noticeably decreased (especially with neck rotation), but there was little change in pain intensity. At visit 3, she reported that she no longer had headaches. Pain had become more localized to the left side, particularly on rapid rotation of the neck. At visit 4, the patient reported that pain intensity had decreased significantly, and there was now only an intermittent sensation of pressure in the upper cervical region. Crepitation had resolved completely and she had begun to exercise with a stationary bicycle. The patient expressed satisfaction with her progress (“95% improvement”). Follow-up DMX was performed one month after visit 4. Straightening of lordosis was still evident, but the offsets of the right and left lateral masses of C1 on C2 (during left and right rotation, respectively), were each reduced to 20%, representing a 33 – 50% decrease from initial values. In absolute terms, atlas lateral shift decreased to 1.12 mm during left lateral bending (as compared to original measurement of 1.85 mm) and to 0.36 mm during right lateral bending (as compared to 0.72 mm). Measurements were performed by Spinal Kinetics. Some anterolisthesis was still noted at C2–C3 and C3-C4. Facet hypertrophy at C4-C5 was unchanged. This case study is the first report describing dextrose prolotherapy and longitudinal imaging in a case of chronic neck pain with clinically and radiographically confirmed instability in the upper cervical region. (See Figure 2.) During the treatment course, the patient experienced progressive symptomatic relief, which began at one month of treatment and included at least partial alleviation of all reported symptoms. The patient showed functional gain, returning to exercise within four months. No adverse effect was observed. At five months after initiation of treatment, a 33 – 50 percent reduction in atlantoaxial offset was observed, providing evidence for improvement in stability. It is not common practice to obtain follow-up imaging in cases where patient symptoms are successfully diminished with therapy. The radiologic improvement observed in this case, in the context of a treatment course potentially promoting ligamentous repair, is consistent with a pathogenetic linkage of ligament injury to traumatic chronic neck pain in the setting of upper cervical instability. Our findings are consistent with previous observational studies of prolotherapeutic treatment of cervical injury. Centeno et al. described the use of dextrose prolotherapy in a case series of six patients suffering from collision-related neck pain with radiographically demonstrated lower cervical instability.9 The spinous processes, lamina and posterior elements at unstable levels were injected with fluoroscopic guidance. Significant gains were observed with respect to both pain and translational stability. The improved stability was more notable with respect to flexion than extension, which the authors interpreted as consistent with the therapeutic targeting of the posterior spinal column. The authors found a strong positive correlation between radiographic improvement and pain relief, indicating that patient-reported improvement reflected a healing process rather than a placebo effect. Hooper et al. described a case series of 15 consecutive patients with chronic whiplash-related neck pain, all of whom displayed clinical lower cervical instability (ligament laxity).10 Dextrose prolotherapy was directed by fluoroscopically guided intra-articular injection to the facet joints at levels that showed both pain and instability. The mean neck disability score showed a 56 percent decline at 12 months post-treatment. Our case report suggests that similar healing may occur in response to prolotherapy at the atlantoaxial joint as well. Figure 2. Prolotherapy to C1-C2 facet joints. Prolotherapy by stimulating capsular ligament repair, tightens the facet joint, resolving upper cervical instability and its related symptoms. Hypertonic dextrose may conceivably act by promoting the microenvironmental release of regenerative mediators that support the restoration of ligament integrity. Elevated glucose concentrations can enhance the production of multiple growth factors related to soft tissue repair, as well as the responsiveness of cells to growth factors.11,12 An alternative prolotherapeutic injectant, sodium morrhuate, has been shown to improve the biomechanical properties of ligaments and tendons.13 Injection of normal rabbit MCL with sodium morrhuate led to a 57 percent increase in ligament mass, which could be largely attributed to a 47 percent gain in collagen fibril diameter.13 Rupture force and breaking energy were increased by 27 – 29 percent. The potential beneficial effects of biomediators to promote ligament repair has been examined in several studies investigating the healing of transected medial collateral ligament in animal models. In the rat model, treatment with platelet-derived growth factor (PDGF) resulted in approximate doubling of ligament rupture force, stiffness and breaking energy within 12 days.14 Similar biomechanical improvement with PDGF treatment was observed in a subsequent study of transected rabbit MCL.15 Thymosin ß4 is a second mediator that has shown positive effects on biomechanical and histological properties of a healing MCL in the rat model.16 This study showed clear evidence of improved collagen fiber organization, which is often deficient in healed ligaments. It may be worthwhile to investigate the interaction of prolotherapeutic agents and biomediators in models of ligament healing. After a course of treatment of trauma-related chronic neck pain with dextrose prolotherapy, atlantoaxial instability was partially corrected, and the patient experienced partial or complete relief of symptoms, including neck pain, headache, crepitation, and tingling, without adverse effects. Dextrose prolotherapy for neck pain with upper cervical instability appears to be a well-tolerated and potentially efficacious procedure. RAH conceived and designed the study, assessed and treated the patient and edited the manuscript. DS coordinated patient care, conducted interviews, and edited the manuscript. PF assisted in providing DMX measurements. The authors wish to express their gratitude to Amos Orlofsky for his efforts in preparation of the manuscript. 1 American Medical Association, Guides to the Evaluation of Permanent Impairment, 6th ed. Chicago: AMA; 2008. 2 Griffiths HJ, Olson PN, Everson LI, Winemiller M. Hyperextension strain or “whiplash” injuries to the cervical spine. Skeletal Radiol. 1995;4:263-266. 3 Antinnes JA, Dvorak J, Hayek J, Panjabi MM, Grob D. The value of functional computed tomography in the evaluation of soft-tissue injury in the upper cervical spine. Eur Spine J. 1994;3: 98-101. 4 Lord SM, Barnsley L, Wallis BJ, Bogduk N. Chronic cervical zygapophysial joint pain after whiplash – A placebo-controlled prevalence study. Spine. 1996;21:1737-1744. 5 Ivancic PC, Ito S, Tominaga Y, Rubin W, Coe MP, Ndu AB, et al. 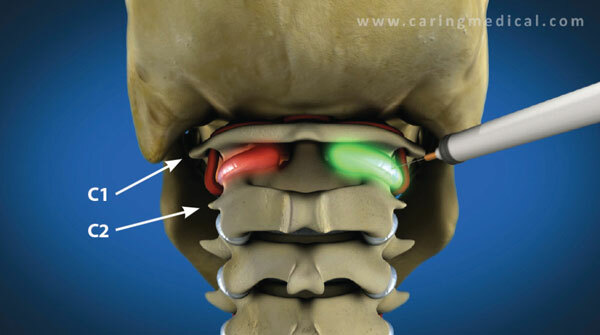 Whiplash causes increased laxity of cervical capsular ligament. Clinical Biomechanics. 2008;23:159-165. 6 Scarpone M, Rabago DP, Zgierska A, Arbogast G, Snell E. The efficacy of prolotherapy for lateral epicondylosis: A pilot study. Clin J Sport Med. 2008;18:248-254. 7 Rabago D, Patterson JJ, Mundt M, Kijowski R, Grettie J, Segal NA et al. Dextrose prolotherapy for knee osteoarthritis: a randomized controlled trial. Ann Fam Med. 2013;11:229-237. 8 Yelland MJ, Sweeting KR, Lyftogt JA, Shu KN, Scuffham PA, Evans KA. Prolotherapy injections and eccentric loading exercises for painful Achilles tendinosis: a randomised trial. Br J Sports Med. 2011;45:421-428. 9 Centeno CJ, Elliott J, Elkins WL, Freeman M. Fluoroscopically guided cervical prolotherapy for instability with blinded pre and post radiographic reading. Pain Physician. 2005;8:67-72. 10 Hooper RA, Frizzell JB, Faris P. Case series on chronic whiplash related neck pain treated with intraarticular zygapophysial joint regeneration injection therapy. Pain Physician. 2007;10:313-318. 11 Fukuda K, Kawata S, Inui Y, Higashiyama S, Matsuda Y, Igura T et al. High concentration of glucose increases mitogenic responsiveness to heparin-binding epidermal growth factor-like growth factor in rat vascular smooth muscle cells. Arteriosclerosis Thrombosis and Vascular Biology. 1997;17:1962-1968. 12 Reeves KD, Fullerton BD, Topol G. Evidence-based regenerative injection therapy (prolotherapy) in sports medicine. In: Seidenberg PH, Beutler AI, editors. The sports medicine resource manual. Philadelphia: Saunders; 2008. p. 611-619. 13 Liu YK, Tipton CM, Matthes RD, Bedford TG, Maynard JA, Walmer HC. An in situ study of the influence of a sclerosing solution in rabbit medial collateral ligaments and its junction strength. Connect Tissue Res. 1983;11:95-102. 14 Letson AK, Dahners LE. The effect of combinations of growth factors on ligament healing. Clin Orthop Relat Res. 1994;207-212. 15 Hildebrand KA, Woo SLY, Smith DW, Allen CR, Deie M, Taylor BJ et al. The effects of platelet-derived growth factor-BB on healing of the rabbit medial collateral ligament – An in vivo study. Am J Sports Med. 1998;26:549-554. 16 Xu B, Yang MW, Li ZZ, Zhang YB, Jiang ZT, Guan SY et al. Thymosin beta 4 enhances the healing of medial collateral ligament injury in rat. Regul Pept. 2013;184:1-5.